The Lafayette Reservoir is located at 3849 Mt. Diablo Blvd, Lafayette CA 94549. Drive down Mt. Diablo Blvd. Meter parking available on the east (left) side. Alternately, use toll gate for all day parking. Walk up the bike trail at east (left) end of parking lot. Look for Roughing It staff in gold shirts. 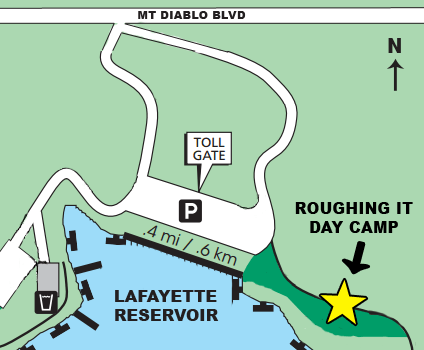 There is all day parking and limited metered parking at the Reservoir. The meters are $1.50/hour (maximum two hours) and $7 for all day parking. Credit cards and quarters are accepted.